Every year between May and July gold completes a summer ICL. Here is what has happened so far in this decade following that ICL. The minimum gain out of a summer rally was 8%. The average rally is 12%. The minimum duration is 6 weeks. The average duration is 10 weeks. If we toss out the long rally in 2012 the average is 8.5 weeks. As I believe gold is in a new bull market I think we should assume at least a 10% gain from the bottom of the ICL to top of the summer rally and at least a two month duration. A 10% gain would take gold back to $1365 over the next 2 months assuming we completed the ICL on Friday. That should at least be good enough for GDX to test the top of it’s trading range at 25-26. 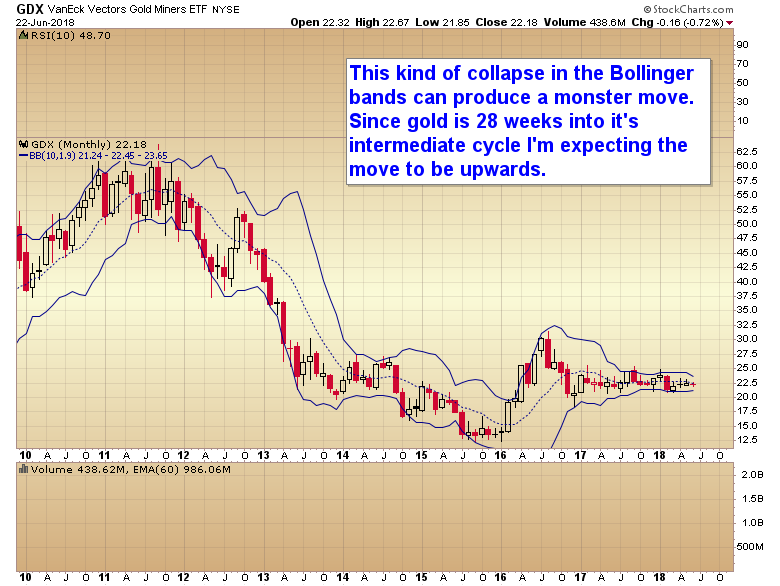 If on the other hand this is the intermediate cycle where gold finally breaks free of its basing pattern and it pushes up to, or through $1400, the Bollinger band contraction has surely produced enough energy for an explosive move in mining stocks that at least tests the baby bull high (roughly $31-$32 in GDX). Remember to profit in the market one has to be able to adapt to changing market environments. The last two years have conditioned traders to expect disappointment from the metals. If that is about to change the vast majority are unprepared for it, and I expect few will be able to adapt quickly to a different gold market and make money from what I think is potentially going to be profitable in a similar degree to the baby bull. Most traders missed that rally as well after having been conditioned by the bear market to expect only lower prices. Don’t forget the 2018/2019 challenge starts on Monday. This entry was posted in Uncategorized on June 30, 2018 by Gary. Here are the results for the 2017/2018 challenge. 1st place: Dennis G with +325% (Dennis you need to email me your address so I can mail out your prize). 4th place Troy S +102% (consolation prize 3 month subscription to the SMT. As far as I know Troy is the only person able to control greed and actually make some money from the bitcoin bubble). The SMT metal portfolio came in 5th with +100%. Alexandru P came in 6th with +95%. Next challenge starts on Monday. It will run until July 1, 2019. Here are the rules. No penny stock trades. There’s too much risk of pump and dump scams in these things. Only stocks $5 or higher, I will accept ETF’s below $5 as some of these decay down to that level over time. No options or futures. Leveraged ETF’s are acceptable. 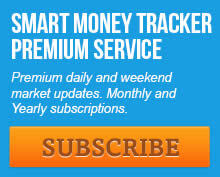 You must email me ([email protected]) your trade entry or exit within one minute of taking it so I can verify. I will respond back with confirmation by the end of the day. If you don’t receive a confirmation you need to resend me the trade in case it got lost in cyberspace. You must include the percentage of your portfolio for each trade. I will only accept percentage, not # of shares. I will calculate the number of shares from the percentage. No day trading. You can stop out for a loss on the same day but you can’t exit for a gain on the same day. I simply don’t have time to try and keep up with frantic day traders and realistically no day trader has any real chance of winning the challenge anyway. The prize will be the same as this year. $500.00 to the winner, and consolation prices for the next 4 runners up. I started the challenge to level the playing field. I got tired of the trolls taking shots at every short term wiggle that went against us and then going into hiding weeks later after the trade paid off. Now everyone has to play by the same rules. Make your trades in real time, no more of this hindsight trading BS that the trolls are so fond of. That crap no longer flies. If you want to criticize someone else’s trades then you better be prepared to make your own real time trades. What I’ve found most amusing as the challenge has progressed is that the most vocal and antagonistic traders on the blog have for the most part turned out to be the worst traders when they actually had to compete by the same rules as the rest of us that live in the real world. The best traders rarely ever posted on the blog. They just calmly went about the business of trying to make money. The winning percentages for the top 5 traders were between about 65% and 70%, dispelling this myth of magical winning percentages in the 90% range. Seriously folks when someone tries to claim they win 80-90% of the time run as fast in the other direction as you can. They are trying to sucker you into buying a subscription to a newsletter. Probably one with “multiple scenarios” like most of the Elliot wave letters, or the vague maybe this, maybe that type of analysis you get with just about all other services. As long as one covers all bases they can always claim they “called it” when in fact they called both sides and then chose the correct one after the result became known. Not one newsletter writer except me had the balls to enter the challenge this year. I wonder if any of them will grow a pair for the next challenge. It will be interesting to see if the winners this year can make it back to the winners circle next year. Consistent winning years are extremely hard to reproduce as what worked one year often doesn’t work the next. Strategies that performed well during one environment often fail miserably during a different environment. The traders that can adapt rapidly to changing markets are the ones most likely to continue making long term, sustainable gains. Those that fail to recognize when the market environment changes and can’t adapt are doomed to failure in the long run. Since the bear market bottom in 2016 the SMT metal portfolio has adapted and stayed ahead of the market and in the process racked up consistent profits. Starting with $100,000 in January of 2016 the metal portfolio is now worth $480,000 and currently at an all-time high (remember the emails recently chastising me for a minor 3% draw down as we tried to get our contrarian trade entered? How stupid do these fleas look today?). The Quest portfolio is up 1360% in the last year (option trades are not allowed in the challenge though). We don’t win every month. Sometimes we even go multiple months without making a dime (this is the period where the trolls crawl out from under their bridge, only to disappear back down their hole when we start making money again), but over time we are consistently growing the portfolio. And in the end that’s all that matter’s: Is the portfolio growing over time, stagnate over time, or losing over time. For the vast majority of traders it’s the second or third. Most traders win big, then lose big, over and over and over. Ultimately they make no long term gains. Or they win big and then lose it all. Most dumb money traders lack the patience and focus to stick with a strategy that makes consistent long term gains. They usually just chase the current momentum fad. That kind of strategy just ends up getting them trapped at tops (or bottoms) when the momentum fails. To really make consistent long term gains you need to become a contrarian. But as we’ve seen over and over that is a very tough strategy to maintain in real time. It requires a different kind of person, with a different kind of mentality. One who can ignore the herd as they chase the last few penny’s of a trend and then get caught at the top or bottom. A contrarian needs to ignore the short term and focus on the long term game plan. I’m often early to a contrarian trade, sometimes by weeks. But in the end contrarian trades are what have grown the SMT portfolio’s consistently over time. So Monday morning we’ll start over again. Everyone will have a fresh $100,000 and we’ll see if any of this years winners will be able to make it back to the winners circle next year. This entry was posted in Uncategorized on June 29, 2018 by Gary. 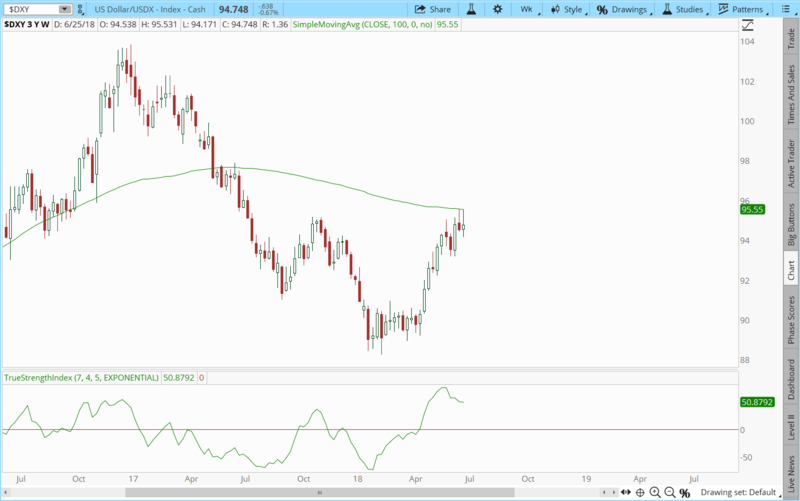 The dollar has failed for the second week to recover the declining 100 week moving average. Also note the divergence in the TSI as the top has been forming. In fact the dollar hasn’t made a significantly higher high in 4 weeks. The 10 day bloodbath phase in gold had nothing to do with currencies. This was purely the banks making money by creating a panic in the metals sector. Soon they will make money on the upside once they have exited their shorts and loaded longs. This is just the world we live in now. The world of free markets ended on that day back in 2008 when the SEC banned short selling in financials. The good news is once the banks are ready to make money on the long side traders can follow behind them and profit once they release the metals to rally. It’s impossible to “know” when the banks will switch sides. But one can get “close enough” to make money. That’s what I’ve been doing for 2 1/2 years now. Just trying to get “close enough”. As of this morning the SMT metal portfolio is at a new all-time high. Yesterday I received and email from some troll with the usual BS. The same crap that I listen to at every ICL. Calling me a phony, charlatan, fake, etc. Claiming I should be ashamed to charge for a subscription. The reality of course is much different. Since the bear market ended in early 2016 the SMT metal portfolio is up well over 500%. We are taking a 3% drawdown from the absolute high in the portfolio as we try to pick the bottom of this correction. A 3% drawdown after a 500% + gain…. I think any sane person would agree I’ve done my job, and done it pretty well. Seriously what rock do these people crawl out from under? And shouldn’t they get their facts straight before making a fool of themselves? This entry was posted in Uncategorized on June 28, 2018 by Gary. 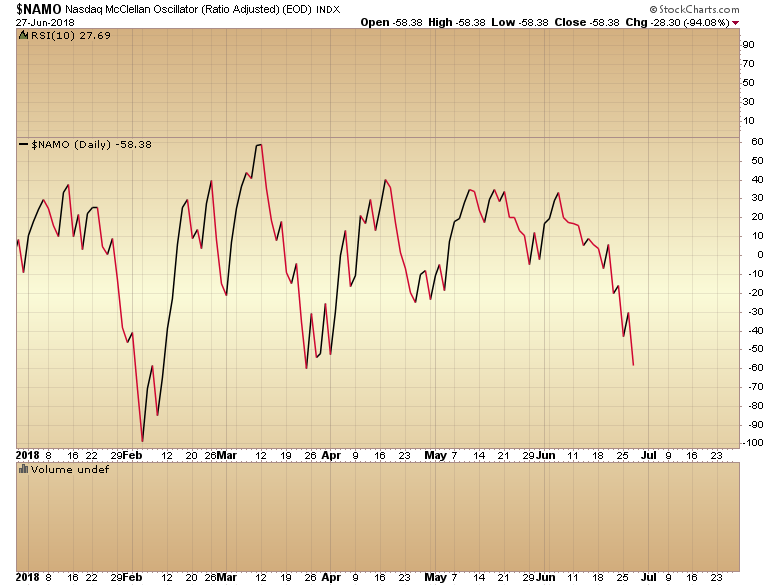 The McClellan oscillator is getting oversold, especially in the Nasdaq. We should get a bounce soon. Depending on how strong the bounce is will give us a clue as to whether we complete the ICL in July or whether we’re going to need another entire daily cycle before the final ICL, and this stretches out to August or early September. If the SPX rallies above the June high then I’d say it’s going to require another complete daily cycle. In this scenario the Nasdaq will probably tag 8000 before we start down into the deeper ICL. A weak bounce that tops in just a few days would lead to a second leg down and a larger intermediate bottom in July. Meanwhile gold is really stretching the rubber band as it moves down into its yearly cycle low. The further the rubber band stretches to the downside the more fuel and the bigger the rally should be once the trend reverses. This should power a monster rally once the YCL is completed. 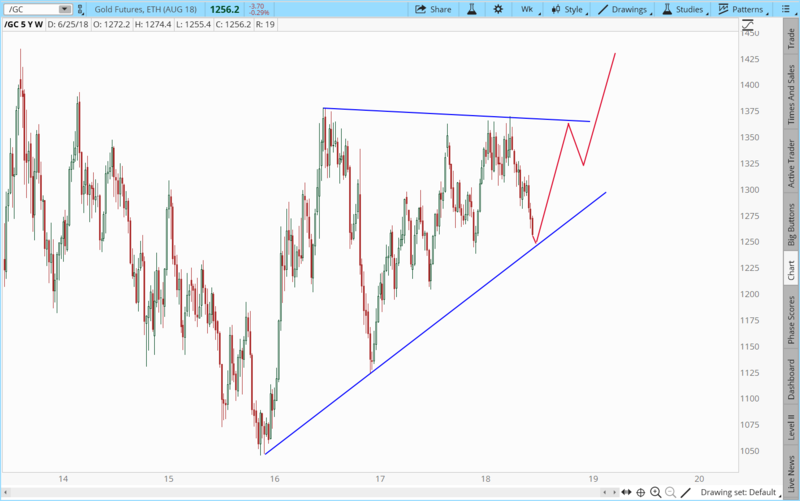 Gold needs about $10 more to tag the triangle trend line (but certainly not a guarantee, bears could get caught in a short squeeze if gold fails to make it all the way to the trend line). That should also push sentiment to full bearish extremes. Usually triangles break on the flat side. This entry was posted in Uncategorized on June 26, 2018 by Gary. 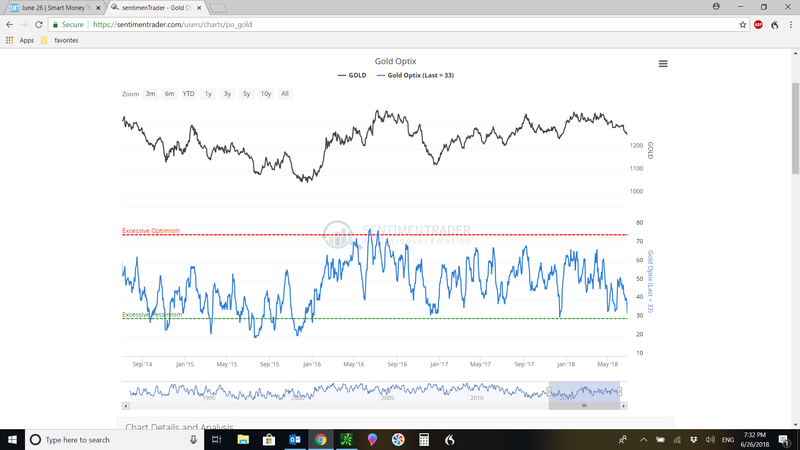 Gold is now in the last phase where the banks try to artificially push it down and panic longs into giving up their shares at rock bottom prices. With the dollar likely already topping gold would not naturally be dropping now. But this is how the banks create a panic at the bottom to trigger stops, and release a high volume of shares and oz. for them to buy cheap. You should not give them you shares during this phase. You should buy or hold in preparation for the rally that will follow once the banks have fully loaded their positions. Bear market? LOL just kidding. While the perma bears will again try to call a top we are just getting a normal profit taking event. The same as February. I tend to think this will morph into a larger degree intermediate cycle decline, which should mean there will be a second leg down after a bounce out of this initial drop. At this point we’ll probably print a temporary bottom sometime later this week and then rally into the 4th of July holiday. After that I’ll be looking for a lower low into the middle of July. If this plays out like I’m now expecting, that bottom in July should be the final buying opportunity before the Nasdaq starts the run to 10,000 by the middle of next year. We’ve spent the first half of this year stuck in a difficult consolidation which was the default scenario if the parabolic move failed to follow through. Price is churning sideways allowing the long term moving averages some time to “catch up”. 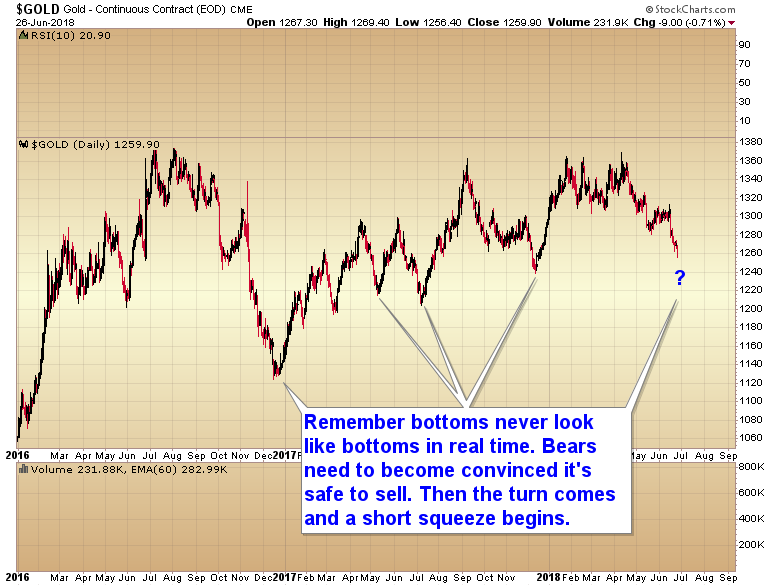 Just like the metals right now, I will be the only one calling for a bottom at the time. Most analysts will be predicting a bear market … just like they were in February. And they will be wrong again… just like they were in February. Get ready, we’re going to get a buying opportunity in stocks soon just like we’re getting a buying opportunity in the metals now. This entry was posted in Uncategorized on June 25, 2018 by Gary. Do you have what it takes to be a contrarian? One of the hardest, but probably the most important traits for a trader to learn is patience. I’ve seen this over and over throughout the years. Traders invariably give up right before a big move is ready to start. Either because the market chopped sideways for too long, or because price suffered a big correction. I’ve noted before markets act like a pendulum, the further price gets stretched in one direction the bigger the move can be in the other direction once the trend reverses. But there’s another pattern that can also produce a big sustained trending move and that is a long frustrating sideways basing pattern. This is a very familiar pattern during an intermediate cycle low in gold. Often there are 3 to 6 weeks of sideways chop followed by one final push down (the bloodbath phase) that causes dumb money to stop out and give up. This is the period where we start to see a lot of analysts jumping on the bear bandwagon and predicting lower prices for the foreseeable future. Does this sound familiar right now? That of course is the fuel for the next rally, and depending on how deep the correction is or how long the sideways chop the next rally can be extremely profitable. It continues to be my opinion that the dollar started a cyclical bear market a year and a half ago. But for the bear market to continue we needed to clear the bearish sentiment that had developed by the beginning of this year. As you can see that has now been accomplished. 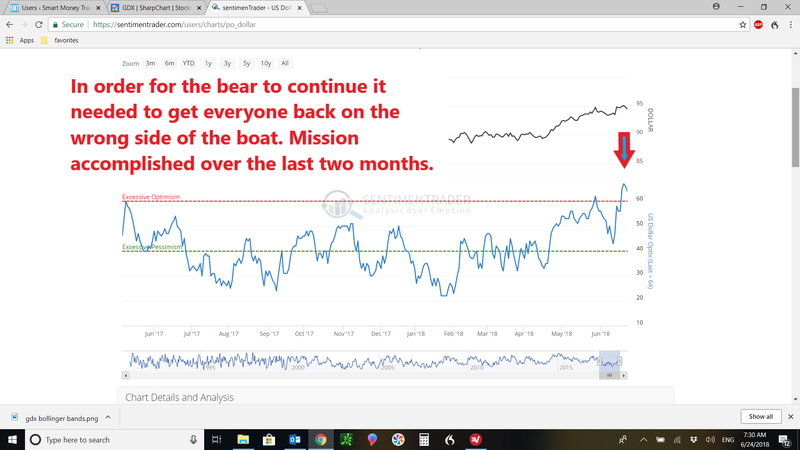 The two month rally has gotten everyone back on the bullish side of the boat and we now have the fuel to start another leg down. It’s my opinion that the next leg down in the dollar will drive a breakout from the basing pattern in the metals market. As I mentioned, a strong trending rally can be driven by either an extremely deep correction or a long period of sideways consolidation. Look at this next chart of GDX. That’s almost 2 years of going sideways, and I can tell you it has completely squashed sentiment after the high expectations generated by the baby bull. This is exactly what we need to see in order to produce the fuel for the next big move up. But I can tell you without a doubt the vast majority of gold bulls have become frustrated and have thrown in the towel, and most of them are going to miss the next rally just like they missed the baby bull. That collapse in the Bollinger bands is unprecedented over the last 18 years, and it has the potential to produce a rally similar to the baby bull. The fact that gold is 28 weeks into its intermediate cycle and now due for an intermediate degree rally pushes the odds very much in favor of the breakout from this volatility squeeze being to the upside rather than the downside. I’m betting July is going to be an interesting month for precious metals investors, but most are going to miss the move because they’ve become disillusioned with the sector. That’s exactly how a bull market shakes off most riders before the next leg up begins. Most retail traders have such short attention spans that if the move doesn’t happen in the next day or two they give up. Very few have the determination or focus to stay on target long enough for the move to begin. Often one will have to stay focused and keep trying for 4-5 weeks, not the 2-3 days that most dumb money traders allow before giving up. I love this video from the big short. It illustrates exactly what happens at every one of these major intermediate cycle lows. If the move doesn’t unfold immediately traders give up and go looking for greener pastures. People start emailing me that I’m wrong and an idiot for thinking the trend could ever reverse. Eventually the trend does reverse, a rally unfolds just as I predicted it would, and just like Michael Burry by the time it’s all over we change the tote board while most people just miss another great opportunity. Currently the SMT metal portfolio is only about $100 below it’s all-time high and positioned for the next leg up once the trend in metals reverses. We’ve been steadily increasing the portfolio from $100,000 at the start of 2016 to well over $500,000 currently. Throughout that entire process at every single intermediate bottom the vast majority wouldn’t listen to me. Consequently almost no one has profited from my ability to call these bottoms. Are you going to again be one of those that gets left behind by the bull, or are you made of different stuff than the majority of traders? Do you have the discipline to stay focused however long it takes, and get in at the beginning of a major trend? Or will you chase it three or four months later after the majority of the profits have already passed you by and then get caught at the top once the rally is over?